I would like to give this Travling Bucktail a couple throws at Elwood to try and catch a few Pike. Then I would pass it along to the next in line. Its currently in route to western Nebraska via USPS. Fishingnerd33 will have it, but he can pass it on to you after. Used the bucktail this past weekend but was unsuccessful in getting a fish on it. Tough bite where we were fishing. I snagged on a log about 20' from shore and actually broke off (must have been a bad knot). After my panic subsided, I waded out and retrieved it...wasn't going to let its journey end that way! I can pass it along now wgibson26 if you can use it right away. We have another trip planned in two weeks and one more a week after that but want this thing to have as much time in the water as possible. THANK YOU, THANK YOU, THANK YOU for not letting the bucktail's journey end!!!! It has so much life left in it. After I got back to shore, I told my wife I was really happy I didn't have to go swimming after it! Water was COLD! I have a trout fishing trip scheduled for July 13th-16th in Wyoming. If it's free, I would love to get it some high elevation work! Guessing I could catch 2 or 3 different species over the weekend with it. I sent a PM to wgibson26 to make arrangements to pass it along. We may fish this weekend, so I'll hang onto it through then and then send it on first of next week so he's got it for the Merritt trip! Hopeful we get out this weekend and I hook up with something on it! We took our annual trip to the Refuge and had a blast! Used the bucktail a lot and finally connected with a 25" feisty pike! 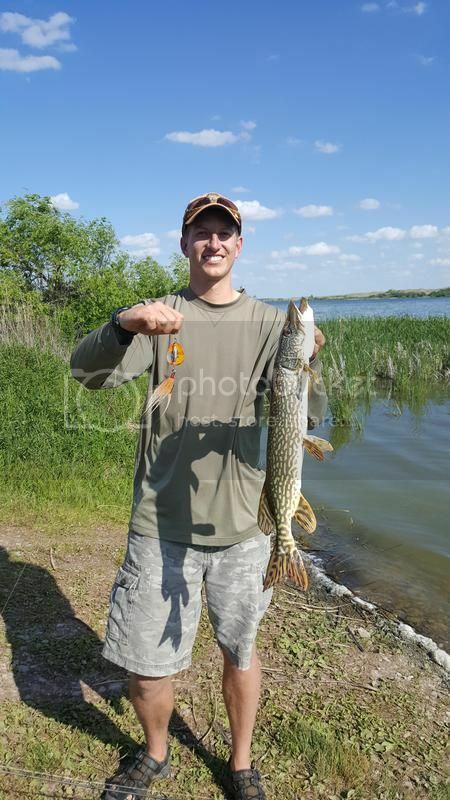 The pike came flying out of nowhere and slammed it about 15' from shore. Absolute rush! The next morning we returned to the same spot in hopes of more success and on the first cast the unthinkable happened. I still can't figure out how, but my line snapped and the bucktail was gone. Before going out that day, I checked my knots, checked my line and leader for frayed spots. I was running 30lb braid, a swivel, 26lb Surflon leader attached to the bucktail. I feel absolutely sick about it and it's been 3 days since losing it. After the line snapped, I spent the next 45 minutes working to retrieve it but it was in vain. I apologize, I feel as though I let a lot of people down. I've been following this thread for years anxious to get it and hopefully catch a fish on the famed lure and pass it along to another angler. I thank those who kept it going throughout the years and I'm sorry to those who had yet to fish with it and won't get the opportunity. It's final resting place is about 40 yards straight out from the west boat ramp on Pelican. Again, a bittersweet 12 hours. Going from the high of sticking a solid pike with it to losing it in the weeds the next day. Last edited by Fishingnerd33; 06-05-2017, 07:04 AM. Sorry to hear about the bucktail, it had a great run. Kinda part of fishing, and it was a matter of time before it happened to someone. It's great to see you were able to catch a fish on it! If it's in anyone's interest, I'd be glad to build a new one and donate it to the next person in line. I know it won't be THE bucktail, but we can keep the tradition going. Atleast its final resting place is heavenly beautiful merritt. If i was a bucktail thats where i would wanna be laid to rest. R.I.P. "It's final resting place is about 40 yards straight out from the west boat ramp on Pelican. " We definitely need to keep this cool traveling lure thing going!!! Fishingnerd33 Don't feel bad about loosing it. Its part of fishing. At least it died the way it should have, and not in some forgotten tackle box collecting dust in an old garage. ​​​​​​​R.I.P. Traveling Bucktail! You have been an important part of the forum for years. May someone find you and be able to catch a PB someday. ​​​​​​​Heck yeah Jthod ! Make us a new one! That's awesome that you're willing to do that...THANK YOU!! PM me your address wgibson26 And I'll see if I can get one put together and in the mail for you by the end of the week.